The Plough at Cadsden is a country pub which has long been favored by British Prime Ministers due to its proximity to Chequers which is the summer home for the UK leader. Cadsden itself is just a hamlet in South Buckinghamshire, England. 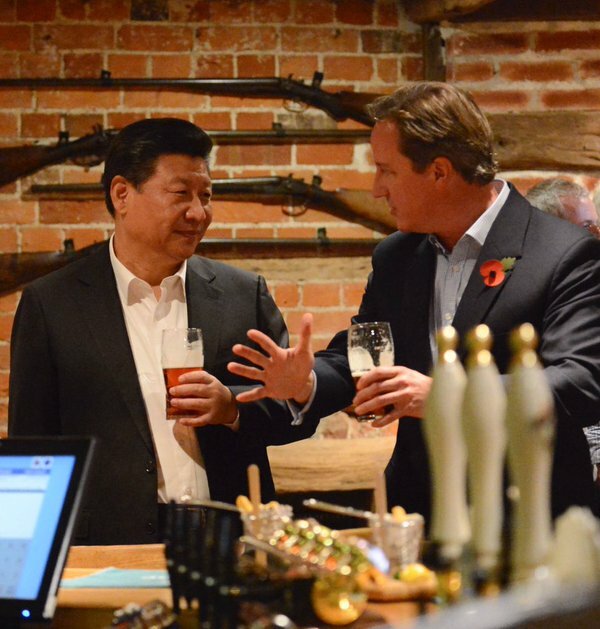 Being the local pub for the UK’s leader means The Plough has served its fair share of dignitaries over the years but the recent visit by Prime Minister David Cameron and Chinese President Xi Jingping has suddenly vaulted the pub into the public’s eye. The Owners are saying they have been booked solid since the Chinese President and Mr. Cameron crack a pint. The pub itself has a long and interesting history as does the small town where it sits. With the The origin of the name Cadsden is widely disputed, alternative spellings have occurred over time, including Catsden, Cadsdean and Catsdean. Wikipedia suggests that the origin may have been as old as Anglo-Saxon and that it could refer to a “valley frequented by wild cats”. Locally, it is believed to have been due to more recent origins, for it is believed that robbers used the area as a bolthole from which they could attack passing coaches and horsemen travelling the road to London. These highwaymen or footpads, were known locally as “cads”, so it is quite possible that this was the genuine origin. There’s probably a joke about politicians liking a pub named after thieves but we’ll that to someone else. If you’re in the UK this is definitely a place that’s worth a visit. You to may be able to take a selfie with the PM or at least throngs of other tourists.